Italian club and Champions League semi-finalists Roma announced Monday their new shirt sponsors will be Qatar Airways in a three-year deal, described as the largest the club has ever signed. The deal was made public just a day before one of Roma’s biggest games for decades, the first leg of a Champions League semi-final against Liverpool at Anfield on Tuesday. “We are delighted to announce this historic partnership between AS Roma and Qatar Airways, two great brands with global ambitions,” said Roma’s president Jim Pallotta. “Today’s announcement is the result of discussions behind the scenes for more than eight months with Qatar Airways… and comes at a significant time in the club’s history, on and off the pitch. “With a new stadium due to begin construction late this year and the team in the Champions League semi-final for the first time for 34 years, it’s an exciting time to be a Roma fan. The deal will last until the end of the 2020-21 season, both parties announced. It is the latest in an increasing line of sporting sponsorships, announced by the state-owned Gulf airline. Famously, it was formerly the Barcelona shirt sponsor for three years, in a deal which ended last year. Qatar Airways is also one of the shirt sleeve sponsors on Bayern Munich’s kit as well as the German giant’s official airline. Roma and Bayern could meet each other in this year’s Champions League final, as the Germans play holders Real Madrid in the other last four match. Qatar Airways also sponsors local club Al Sadd, whose captain is former Barcelona legend Xavi Hernandez, and will be a FIFA sponsor of the 2022 World Cup, which will be hosted by Qatar. “We are very pleased to announce this new partnership, which will see Qatar Airways become the official shirt sponsor of AS Roma through the 2020-21 season,” said the airline’s boss Akbar Al-Baker. 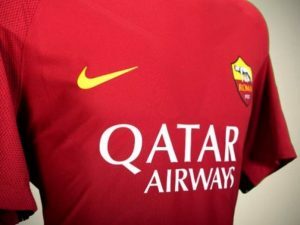 0 Response to "Qatar Airways sponsors of Barcelona becomes Roma’s new shirt sponsors"